Blood Ritual is so busted with Preparation. Hardly. It's a 4 card combo that only gives you a beating stick. If you build your deck around it, and your opponent kills the bancient one, you loose the game. If you don't, you either have to break the combo so you don't loose the game, or you're stuck with up to 3 dead cards in hand. I'd say it's fine. NiRaSt posted a message on What card do you want to make work? Deathwing, Dragonlord is the absolute card I want to make work. But ever since it was introduced i haven't been able to build a strong T1-T2 deck around it and it saddens me. It's impossible to enjoy Hearthstone with a 30% WR. I have it golden and I think I will dust it, I already dusted golden Chillmaw yesterday, I don't feel too bad about it... Except that I crafted these cards in the first place. 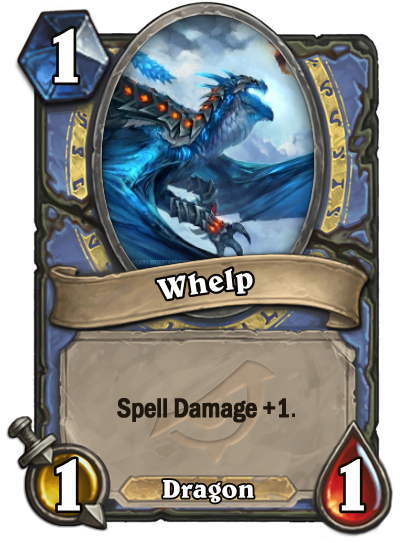 Someone please tell me not to dust Dragonlord and why. I've had this idea for a Bone Drake Priest deck that only focuses on summoning as many of them as possible so when you play N'Zoth you have a full board of 'em. Maybe you can make it work there with Reckless Experimenter and a bunch of coin generators. 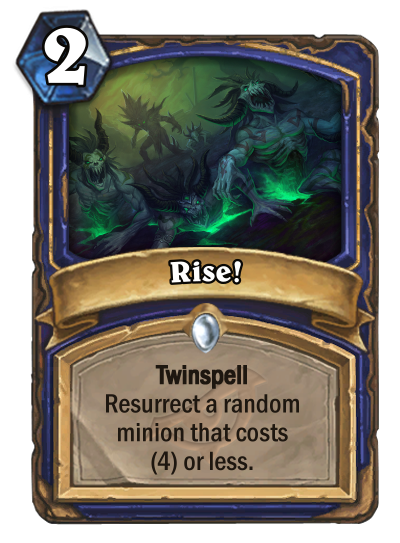 Mage already has access to Twinspell. You must use one of the 5 E.V.I.L. clases: Warlock, Preist, Shaman, Warrior or Rogue, the latter being the most thematically fitting.. The idea itself is pretty cool. 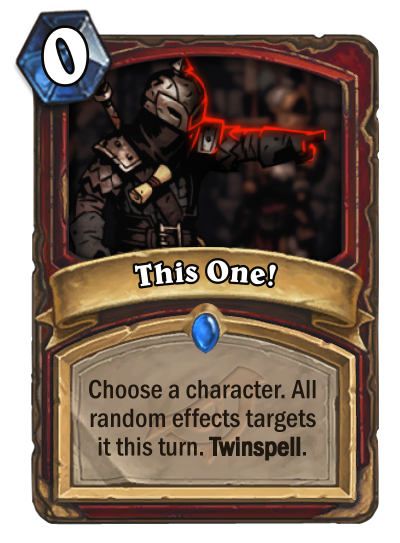 Unfortunately, the card itself must either be a Twinspell fur one of the classes I mentioned earlier, or a scheme for one of the others. 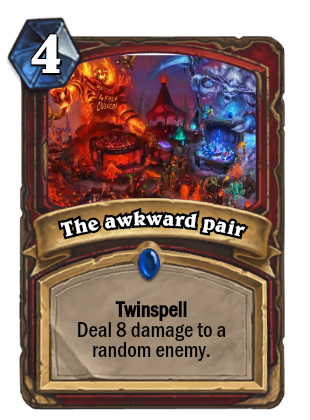 Wait a few turns so your opponent's deck gets smaller, and play the other spell to blow him up. Play the other spell right away, and hope to blow him up. 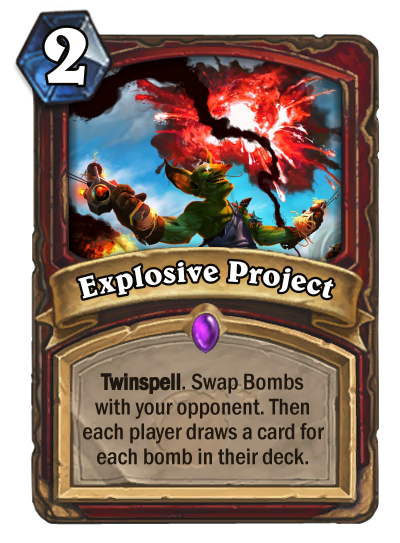 Double his bombs with Augmented Elekk. And probably other combos I'm not aware of. What do you think? I decided to go with villains, partly because I like exploring which characters could've returned and partly because bad guys are cooler. 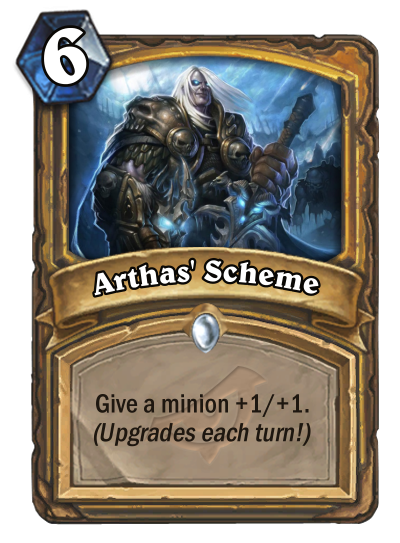 Arthas can get pretty out of hand, but it's the most interesting one if you ask me. 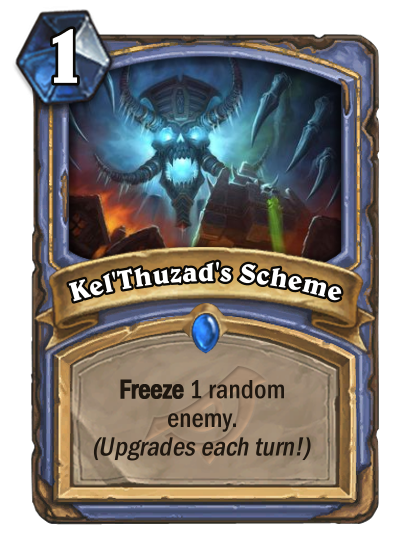 Kel'Thuzad could probably cost 3, considering Frost Nova. 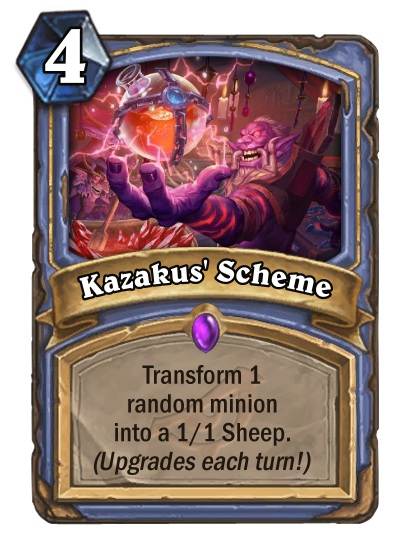 Kazakus... no... just... no. 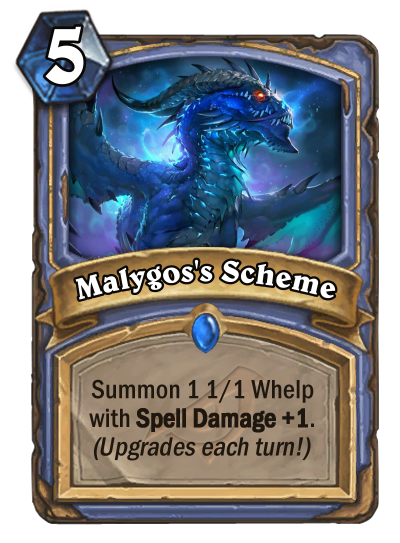 Both schemes are interesting, but I think I like Maly more (even though it enables some stupid combos). The twinspell is also interesting, but what happens when your previous HP is not the basic one? Compared to Divine Hymn, it seems balanced. Or it would be, if it could only target friendly minions. As is, it's broken with Auchenai effects. A crazy idea...and an even crazier idea! The intention is that the first version on the left goes wide, while the second version on the right goes tall. 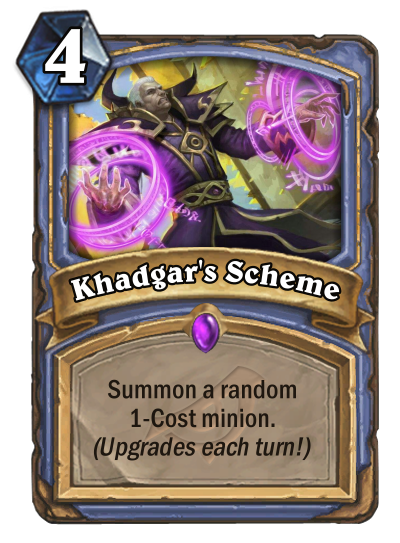 And, of course, it can combo with Khadgar himself for a truly diabolical development (one moreso than the other). 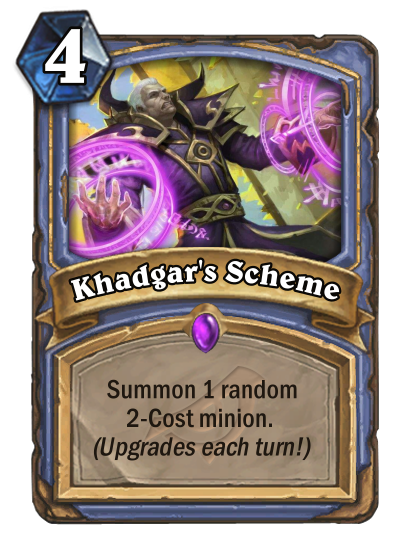 The second one seems fun, unless you intend to make some sort of Zoo Mage. The second one could cost 5 or 6, though. Randomly shooting ice and fire shouldn't be the plan of a city like Dalaran. But it works." Well, not sure if counts, but Ragnaros is in some way the good guy in Blackrock, so here goes nothing. Don't really like the flavour, since this has nothing to do with Ahune. 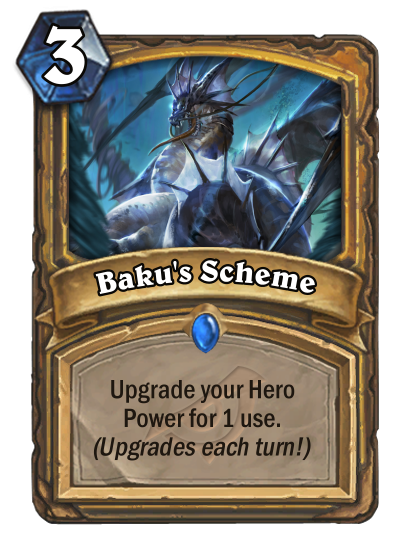 Not sure about the cost of This One!, but I also want Yogg to work with it (Glory to him!). 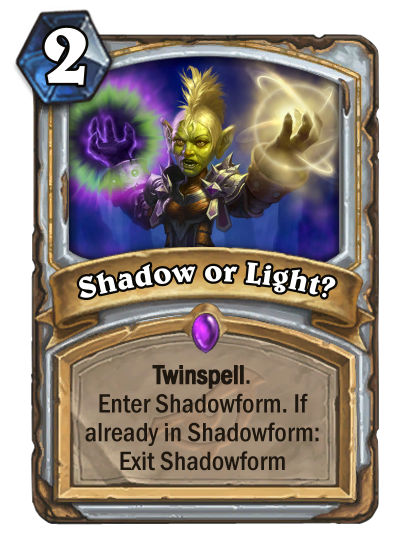 Just a Head's Up: Twinspell is usually the frst word on the card. Dark Shield - Tech against big minions in meta or just a small heal against enemy minions or friendly damaging cards. The second cast does nothing if the first one is still in use. 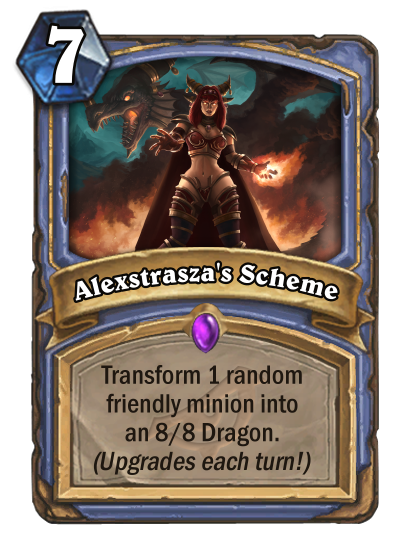 Alexstrasza's Scheme - From what I remember from WoW, she was an imposter infiltrating Alliance in human form and something was up with her Brood. I don't remember all, but I think card text matches her lore. Also, I tried to fit Mage's "Many big minions" theme that RoS introduced. Edit: To clarify, only the amount of minions transforming is upgrading, the stats of the Brood stay the same. Which one should I go with? Or should I create something new? 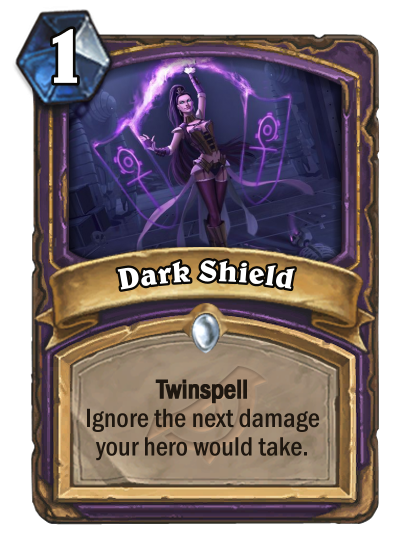 So Dark Shield is basically "Give your hero Divine Shield"? 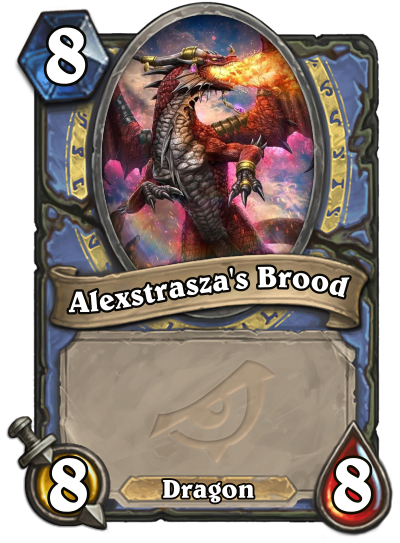 I think you're confusing Alexstrasza with Onyxia (though my lore isn't perfect either). 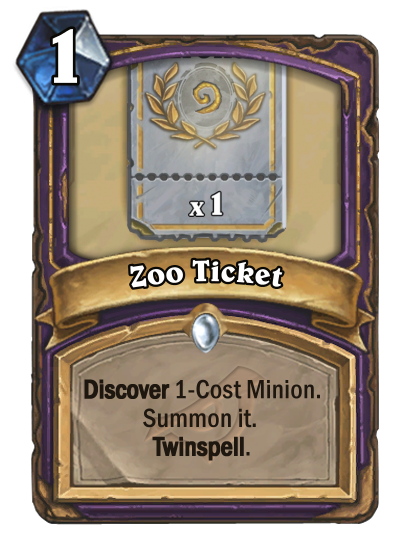 The card itself seems balanced, unless some sort of Zoo Mage appears. Resurrection is mostly a Priest thing. Your card is also worse than Ressurect. You know you could've just switched to the American region, right? NiRaSt posted a message on Soo.. just played Jepetto Joybuzz and he didn't draw. Maybe you need to have at least two minions in deck for him to trigger? NiRaSt posted a message on So which decks counters bomb warrior? I've seen people say Thief Rogue, but if you rely on the cards you get to win, you're gonna have a hard time Most Warrior cards are pretty bad standalone. Thief rogue counters because of the lifesteal, buffed, essentially endless weapon. Allows you to do everything except take 6 bombs to the face. Since you’ll be shuffling 20+ cards into your deck this is very unlikely. I'm not kidding, I discovered one from my Firetree Witchdoctor turn 2, let it grow all the way up to 18 Armor, basically negating most of his bomb. I would've won too, if I didn't give him 14 Armor by accident. 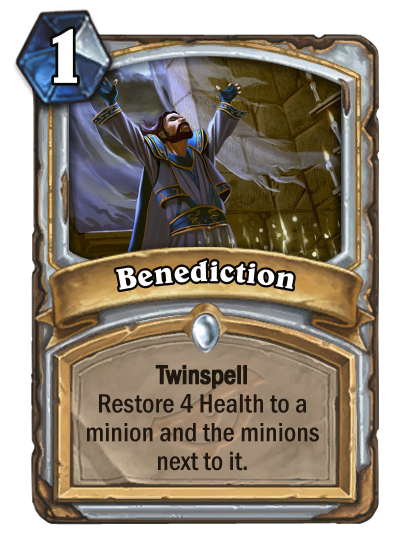 Or if he didn't get Archbishop Benedictus from Toki, Time-Tinker from Weaponized Pinata. 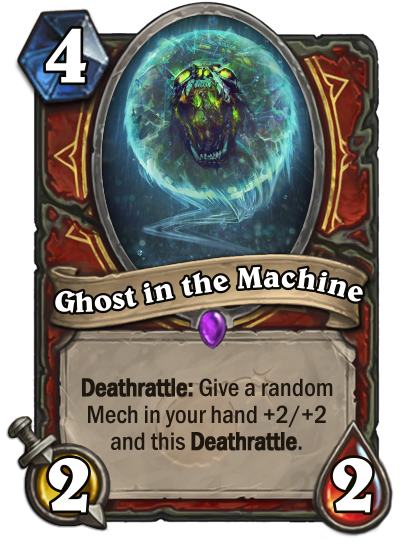 With mech hunter I honestly don't know, that archetype looks so boring to me so I haven't tried it but it does make sense, a rather fast deck with sticky and problematic minions to remove, sounds like it farms tempo decks. I'm playing a version that gains a lot more Armor that the average Bomb Warrior, and I can say that I would've lost to Mech Hunter (well, Goblin Bomb Hunter) if I didn't get Nozari from Dragon Roar. It's not worthy to spend all your dust in to a single deck. If you are missing a legendary and 1-2 other cards - then by all means - go ahead and craft them, so you can enjoy the RNG madness. But if you are missing half of the deck (it got a lot of epics in it too), then I would suggest save your dust for something better. Boom warrior is really slow and clunky deck with no real win condition except - waiting for opponent to draw the bombs from his deck and a variety of counters (aggro, liam, rafaam on top of my head) - it is not a deck that will boost your way to legend with 90+% winrate. How is Liam a counter? The bombs cost 5. NiRaSt posted a message on Arena Rewards Megathread! Check your collection They're usually added without telling you. Did you notice a difference in the amount of packs/gold/dust you have?